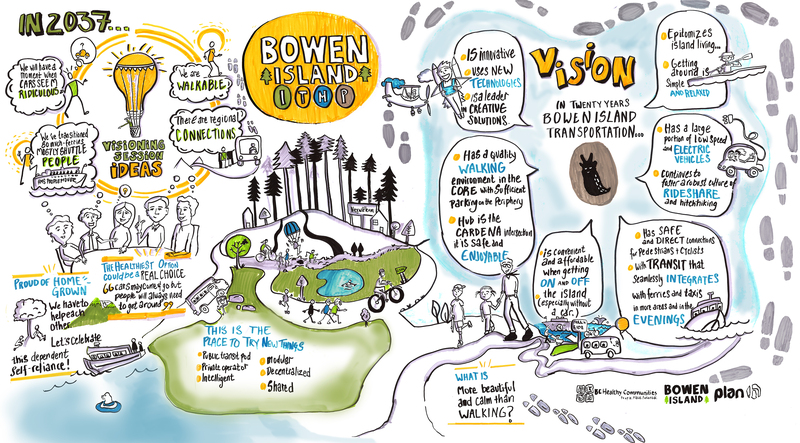 How can we use smart solutions to make Bowen Island an even better place to live, work and visit? Bowen Island Municipality has entered the Smart Cities Challenge, in which the Government of Canada has invited communities of our size to compete for a prize of $5 million. The goal is to solve community challenges using innovative data and connected technology to achieve meaningful outcomes for residents. Bowen Island's proposal is to develop and implement a Community Mobility Platform to harness the power of mobile, social, local, and real-time technologies - with a dash of crowdsourcing - to address the transportation and mobility challenges endemic to Canada's smaller, rural cities and towns. The proposed platform would seek to significantly broaden the palette of mobility options available to residents of lower-density communities, including coastal communities, so citizens of all ages and ablilities can get to where they need to go, when they need to do so, without needing to get behind the wheel of a private vehicle. Residents of small communities across the nation are looking for efficient, affordable, low-impact mobility and transportation options, and this proposed project would ultimately provide it to them. Along the way it seeks to reduce greenhouse gas emission, improve quality of life and public health, and strengthen connections and resilience. The proposed project would not only seek to strengthen local economies in small communities that often depend on tourism or natural-resource revenue, it would drive clean growth and innovation. Question 1: Please provide information on the community that is submitting this application. Question 3: Please define your Challenge Statement in a single sentence that guides your preliminary proposal. It should describe the outcome (or outcomes) you hope to achieve. Our community will dramatically reduce its high reliance on single-occupancy internal-combustion vehicles by implementing a Community Mobility Platform - to enable a greater array of on-demand, shared, and low-carbon mobility options—measurably improving mobility choice, public health and safety, while strengthening community connections, supporting local economic opportunities, and lowering carbon emissions. Question 4: Please describe the outcome (or outcomes) your proposal seeks to achieve by elaborating on your Challenge Statement. Though Canada’s large Metropolitan Areas continue to grow, population growth is greater in the surrounding peripheral lower-density, rural, and semi-rural communities that have higher per-capita greenhouse gas emissions and that remain stubbornly difficult for publicly funded transit and transportation agencies to effectively serve. 1. Improved Mobility Choice: Private, single-occupancy vehicle use in our community remains very high because effective alternatives are scarce, and largely absent active-transportation infrastructure, combined with steep topography, serves as a barrier to cycling. There is yet no practical way to connect residents who may be heading in the same direction at the same time. If our project is successful, by 2025 residents will have a much wider range of options available to them beyond the single-occupancy private internal-combustion vehicle when they want to or need to move from Point A to Point B. Options will include shared vehicles, on-demand services, and others. They will have, at their fingertips, access to a range of options affording them flexibility on time, price, mode, and more. 2. A Healthier, Safer Community: A clear and growing body of evidence links private-vehicle dependence with a wide range of negative public health outcomes, including respiratory issues from poor local air quality, higher rates of obesity and risk of chronic conditions such as heart disease, diabetes and stroke, and higher rates of injury from crashes and accidents. Pending a successful outcome of this application, and the completion of other parallel and aligned initiatives such as the Multi Use Cross Island Pathway and active school transportation planning, we anticipate vehicle traffic will decline even as we grow, and greater numbers of Bowen Island residents will be walking and cycling to and from work, school, shops, and services. A recent community survey found that only 10 percent of residents regularly walk, cycle, or take public transit to get where they need to go. We would aim to see this indicator significantly improve. Fewer private vehicles overall will mean less traffic, which in turn will lower the risk of conflict between people and cars. 3. A Complete, Connected, and Livable Community: If our application is successful, a wider array of mobility options will not only make life easier for commuters who will enjoy more time at home with family. It will also be strengthening connections between young families, youth, and elders. An on demand- and route-flexible community shuttle will incentivize higher public-transit ridership, which would better support “aging in place” for elders, and afford greater independence for youth. Our community would see a measurable improvement in transportation system equity for these users. Further, the proposed platform will connect community members with one another, building on and strengthening the social linkages and trust that already exists in smaller communities and that will be key to improved resilience in the face of worsening climate change. 4. Affordability and Local Economic Opportunities: If our application is successful, residents will be spending less on transportation costs and more money will be circulating in the pockets of Bowen Island residents. With improved mobility options and reduced dependence on single-occupancy vehicles, community members will be paying less for insurance, maintenance, and fuel, and will have more money to spend on other things. The Community Mobility Platform will support independent local transportation providers through increased passenger numbers and by facilitating greater integration into the community’s new mobility ecosystem. 5. A Climate-Friendly Community: We believe that even the smallest communities can, and must, do their part to keep global temperature increases below two degrees. British Columbia’s electricity system has very low carbon intensity, and the provincial natural gas grid does not extend to Bowen Island. As a result, transportation accounts for up to 90 per cent of our community’s greenhouse gas emissions. By reducing the need for single occupancy trips in internal-combustion vehicles, our proposed project will significantly reduce our community’s emissions. If our application is ultimately approved, the Community Mobility Platform would serve as a pillar of the community’s strategy to reduce emissions 30 per cent by the year 2030, in line with the Government of Canada’s commitment under the Paris Agreement. Bowen Island, British Columbia, is a semi-rural island community located in Howe Sound, just off the shore of West Vancouver. The BC Ferries vessel Queen of Capilano connects the community’s village of Snug Cove with Horseshoe Bay, West Vancouver—our transportation gateway to the wider Metro Vancouver region. Bowen Island is typical of many rural and semi-rural, low-density Canadian communities in that it presents significant challenges with respect to transportation planning, coordination with regional transportation services, and infrastructure funding. According to the 2016 Census, our year-round population is 3,680, which reflects 8.2 per cent growth from 2011. (In the summer, our population swells to about 5,000 with part-time residents who maintain vacation properties here.) Our small tax base limits opportunities to fund transportation infrastructure. In the previous five-year period, population growth was only 1.2 per cent. As housing prices have soared in Metro Vancouver, the pressure has increased our population, particularly in young families. Bowen Island also remains an attractive retirement destination. In 2017, Bowen Island Municipality conducted an annual community survey to better understand perceived quality of island life, municipal services, transportation, emergency preparedness and housing. The goal of the survey was to provide an opportunity for community feedback, to guide strategic planning for the municipality, and to collect baseline data. Responses confirmed that islanders heavily rely on privately owned vehicles for transportation both on and off the island. Private-vehicle reliance is slightly higher for on-island trips (84 per cent) versus trips off the island via the ferry (75 per cent). Only 10 percent of residents report using walking, cycling or transit as their main mode of transportation on island, with a slightly higher mode share off-island mainly due to regular commuters. The survey also revealed that Islanders are dissatisfied with on-island pedestrian and bike safety, and perceived low municipal support for active modes. Only one-quarter of residents were “moderately” satisfied with overall safety, affordability, convenience of options, connectivity of transportation networks, bus service (routes, schedules and fares), with the majority reporting lower satisfaction levels. Sixty-eight per cent of Islanders indicated they would consider reducing the use of their private vehicle if alternative modes were more seamless and easier to use. According to Statistics Canada, 58 per cent of employed or self-employed residents leave the island for work. Of those who commute, 59 per cent do so behind the wheel of a private vehicle; 21 per cent use public transit. Census figures also indicate that off-island commuters tend to head mainly to the Vancouver downtown core and, to a lesser degree, North Vancouver and West Vancouver employment areas, and have a higher than average commute time of more than one hour each way. To understand and quantify travel patterns, and inform development of its forthcoming Integrated Transportation Master Plan, Bowen Island Municipality hosted an online survey from March to April, 2016. An impressive 22 percent of households responded. The research provided valuable data on typical weekday trips—such as mode, trip purpose, and user demographics. In 2012, the Province of British Columbia’s Community Energy and Emissions Inventory (CEEI) assessed Bowen Island’s climate pollution at 13,489 tonnes of equivalent greenhouse gas emissions, or 3.66 tonnes per capita, per year. However, the assessment excludes ferry emissions which, without our community, would not otherwise occur. A 2003 report, “Bowen Island Community Energy Planning Options Report” assessed ferry emissions at approximately 7,381 tonnes—though the number has since increased due to equipment changes. Including ferry emissions, the community’s “actual” emissions are at least 20,870 tonnes equivalent greenhouse gas emissions, or 5.67 tonnes per capita. (If our inventory included ferry emissions, Bowen Island would rank among the highest of all Metro Vancouver municipalities on per capita greenhouse gas emissions.) The 2003 report also concludes transportation emissions account for 90 percent of our community’s total. Bowen Island has about 75 km of public roads, most of which are paved with little or no shoulder. At present, the community lacks dedicated active transportation infrastructure, with the exception of half a kilometer of sidewalk through the village to the ferry terminal. Municipal Council is currently considering an Integrated Transportation Master Plan that will focus investments in active transportation and public transit, and identify funding sources. Final adoption is planned for Spring 2018 as well as construction of the first phase of a Multi Use Cross Island Pathway, with further funding pending from TransLink, the regional transportation authority, and BikeBC. The municipality has also secured funding to undertake active transportation planning for the community’s elementary school. Two Translink (public transit) community shuttle flagstop routes connect various residential neighbourhoods to Snug Cove but do not provide complete island coverage. These run at basic service levels, and follow the ferry schedule. The transit vehicles do not meet current accessibility standards and lack GPS capability for real-time tracking. In addition to public transportation the community is also served by private water taxi services, a private taxi operator, and a commuter express bus to downtown Vancouver. However, none are seamlessly connected and integrated into the wider transportation ecosystem and as a result serve a very limited passenger base. Evidence to support the selection of this/these outcome (or outcomes) over others, in reference to the needs of the community. In the 2017 community survey, residents clearly prioritized housing diversity and affordability, and improved access to medical services. Preliminary discussions with housing stakeholders have not yet revealed an obvious Smart Cities approach to address affordability. However, improved access to transit, active transportation and car share/rideshare opportunities clearly contribute to housing affordability. Respondents also cited poor access to medical services both on and off the island. As noted below, our proposed Community Mobility Platform will incorporate a medical driver program that matches drivers with patients looking for rides to medical appointments. This program is currently manually administered by the Caring Circle, a small community non-profit organization. The survey included 283 additional comments on transportation, and many dozens highlighted the need for safer pedestrian and cycling infrastructure, improved island transit, better regional transit coordination, and improved integration of private transportation options such as taxis, water taxis, and a privately operated express bus service between Horseshoe Bay and downtown Vancouver. In September 2017, the Bowen Island Community Foundation hosted 61 residents from all walks of life to discuss community needs and improvement opportunities at the 2nd Vital Conversations Summit. Participants identified housing, diversity and inclusion, healthcare, youth, volunteers, environment, and transportation as priority action areas. Transportation-specific needs included improving community transit, providing electric community co-op vehicles, and lowering barriers to active transportation. Other than strengthened youth support networks, none of the other areas of improvement appear to lend themselves to a Smart Cities approach. - Consider alternative service delivery models (ie on demand service) and service to new residential areas. - Improve access and accuracy to transit schedule, routes and maps. - Review and improve transit connections at ferry terminal and the rest of the regional transit network. - Consider the feasibility of generating real-time transit information to inform customers of current conditions. - Consider options for higher quality passenger data collection. - Develop procedure to improve connections with late ferry arrival. In 2015, during a four month refit of the Queen of Capilano, our usual ferry was replaced with a much smaller vessel and alternative transportation modes and incentives to decrease private car usage were introduced to mitigate ferry overloads. A pilot project of integrating a commuter bus with a private passenger only water taxi service was undertaken and proved successful. The service has continued to operate and has shown that residents will choose alternative transportation modes if they are faster and more efficient than private vehicles. We feel that consistent community feedback on the need for improved mobility—and the multiple social, environmental, and economic co-benefits such investments would unlock—make integrated mobility an appropriate focus for this application. Rationale for applying a smart city approach to achieving the identified outcome (or outcomes). Rural Canada’s mobility challenges are, at their core, connection challenges. We believe the Smart City approach will make a significant contribution to cost-effectively and equitably meeting our community’s growing mobility needs while reducing greenhouse gas emissions. In addition, our community’s fixed borders—we are surrounded by water—offer an unique opportunity to collect data and evaluate success within a “contained system” that in turn exists within a broader regional transportation framework. By combining mobile, social, geo-enabled, and real-time technologies—in a fun and engaging manner—we believe a Smart City approach as manifest in the proposed Community Mobility Platform offers tremendous promise to address challenges facing not only Bowen Island, but other low density communities across the nation. Strategy for measuring progress toward outcome (or outcomes) and achievement of outcome (or outcomes). If our proposal is accepted, our project team would consult with stakeholders and technology partners to develop a robust Evaluation Strategy, which would establish success indicators associated with the project’s five desired outcomes, and track progress towards them. While good data is readily available on a variety of project indicators, such as total vehicle registrations, greenhouse gas emissions, transit use, and overall program participation, we would need to commission original public opinion research to source reliable data on perceived quality of life and health and safety objectives. Such research would seek to confirm or revise our understanding of current conditions and establish a baseline and then revisit the issues at regular intervals. In addition, the Community Mobility Platform in of itself would yield a wealth of data about usage patterns, and we could potentially incentivize regular participant surveys. The overarching objective of any Evaluation Strategy would be to listen to users and rapidly innovate, or adapt the program, based on the lived experience of those who are actually using it. We grounded our Challenge Statement in priorities identified through one of the most exhaustive public engagement and stakeholder consultation processes conducted on Bowen Island to date. The municipality initiated the engagement and consultation process to develop the community’s first Integrated Transportation Master Plan. The municipality is committed to providing its residents with engaged, accountable, and effective government. Work on the project started by convening a working group of community volunteers, who reflected a diversity of island demographics. This group in turn worked with the Community planner to develop a comprehensive engagement strategy, which sought to connect with islanders through a mix of real-world connections at community events, direct mail, social media, open houses, and interactive workshops. The team promoted engagement opportunities via advertising, flyers, and more. Via online outreach efforts, the team logged 113 connections, and close to a hundred comments, which identified the imperative for transit service improvements, followed by the need for safer walking and cycling. Almost half prioritized improved walkability, 22% wanted the plan to prioritize cycling, 20% sought improved accessibility for those with mobility challenges, while 9% wanted improved roads for cars. A series of face-to-face outreach sessions complemented online outreach. A session at the Snug Cove ferry dock captured the priorities of approximately 400 to 600 commuters and other ferry users. A session at the Legion community lunch engaged with and logged feedback from approximately 20 elders. A third, held at the elementary school, reached 40 busy young parents—traditionally, a very difficult group to reach—as well as about the same number of youth. This latter session yielded the most passionate, and consistent, feedback. Overwhelmingly, kids and parents said they wanted active-transportation infrastructure. Beyond citizen engagement, the team also conducted stakeholder consultation. Workshops between representatives of public agencies and island businesses and others identified clear priorities for public investment, namely a multi-use path, improved public transit service, and improved regional connections. Stakeholders also confirmed demand for a variety of alternative mobility options, including low-speed vehicles and ride sharing. In the summer of 2016, the team followed the workshop with four neighborhood meetups to collect additional feedback. Residents hosted outreach teams in their homes, in areas that may have had lower accessibility to other engagement opportunities. The project team ultimately engaged with 1,000 people—close to one-third of the community’s total population. This input, combined with feedback from stakeholders, established a community vision, determined key priorities for transportation improvement, identified specific locations needing better connections, and opportunities for partnerships and innovation. As a result, the municipality is confident that the draft Integrated Transportation Master Plan closely mirrors the community’s vision and needs. As we have grounded our Challenge Statement in priorities identified through this process—again, one of the most comprehensive engagement and consultation processes ever conducted in our community— we are similarly confident it addresses the community’s priorities and concerns. Should our Community Mobility Platform proposal prove successful, our team would likely use this engagement and consultation plan as a template for a new engagement and outreach plan to re-engage with community and stakeholders. Our goal would be to develop the details of the Platform in close consultation with the community and key stakeholders, to ensure it effectively addresses their priorities. A beta testing version would afford an opportunity for further refinement. Our proposed project is the Community Mobility Platform, a service that would enable residents to affordably, safely, and efficiently get from A to B, on demand, without relying on single-occupancy private vehicles. The platform would facilitate multimodal trip planning appropriate for the needs of Canada’s smaller, lower-density, vehicle-reliant communities. In addition, we would request some additional limited IT infrastructure support, to enable ride-sharing infrastructure, and limited low-level “smart” pedestrian lighting in key areas. Though smaller communities have common mobility challenges, they also often have “unique” components in their transportation system. In Bowen Island’s case, this is the vehicle ferry that connects our community to the rest of Metro Vancouver. Given the central role the ferry plays in our economy, for many, its schedule sets the pace of island life. Our proposed platform would need flexibility to support these circumstances, as a “standard” offering, developed to meet the needs of larger markets, would not necessarily meet ours. Though we would develop the Community Mobility Platform’s final list of capabilities through community consultation, recent and extensive community engagement and stakeholder consultations have yielded the bones of a preliminary specification. - Real-time tracking of all available mobility options and transportation-service providers, public and private (such as a community private taxi service, or private bus shuttle) with associated cost and time options. - Replicability. The Community Mobility Platform must ultimately be made available and accessible to other smaller, resource-constrained Canadian communities at minimal cost. - Support for open data standards. - Crowdshare contributions for reporting critical delays or road conditions issues, as well as positive, fun, playful contributions, such as “orca spotting alerts” while aboard the ferry. - Facilitating access to an on-demand and route-deviated GPS enabled community public transit shuttle. - Community and commuter ridesharing and community carpooling. For example: After school activities/sports event, sharing for households without a car, elders unable to drive, and weekenders who choose not to bring a vehicle to the island but who would like to access places beyond the reach of the community shuttle. - Planning for “utilitarian trips.” For example: Capability for members to pre-arrange shared shopping trips or larger cargo trips to Metro Vancouver, such as trips to popular furniture and houseware stores. - On-demand requests, ie “digital thumb” functionality that would connect those seeking rides on the fly with others headed in the same direction in private vehicles with empty seats. - Wheels for Wellness; rides for those attending medical appointments. - Incentives for increasing vehicle occupancy, such as preferential ferry loading, as well as incentives to choose non-motorized or low-carbon transportation options, such as scooters, e-bikes, or electric vehicles where available. - Tracking of individual usage metrics, such as greenhouse gas emissions, estimated journey time, and trip cost, and provision of non-personally identifiable data (metadata) for administrators to measure platform uptake and impact. It would also act a bit like a “wearable fitness activity tracker” measuring the benefits of active transportation choices. - Secure, seamless and trusted transaction processing. - Digital infrastructure that could be used to implement a small-scale e-bike, car share, or car/van co-op. Gamification - by rewarding those that offer rides or change travel behavior with real world incentives like being able to earn travel vouchers or credit to spend at local stores. In addition to the above, there are a few challenging and unique mobility issues that we would hope the Community Mobility Platform would help us address. For example, we would like to investigate the platform’s Traffic Demand Management functionality with an eye to mitigating or solving chronic ferry marshalling issues. In addition, we are interested in a smart parking strategy. Our commercial village acts not only as a central community hub but also as a central parking area for visitors, businesses, and residents. On top of this, it is also an unstaffed, self-regulated ferry-traffic marshalling area. This component of the project would entail a proof of concept to adapt current best practices in smart cities parking solutions to better manage parking in the village and as well as to introduce paid parking. Parking revenue could be used to support alternative transportation infrastructure. The concept would be to explore the feasibility of using in-pavement or overhead radar detectors to monitor on-street parking and the ferry line up. Ferry line capacity and available parking would feed into the Community Mobility Platform, facilitating more efficient use of available parking and road capacity, and better managing ferry marshalling. If this proved to be a viable and successful solution this could be shared with other ferry dependant communities and ferry terminals. Supportive Infrastructure: Investment in low-level street lighting using smart cities technology to improve pedestrian safety in our village while adhering to dark skies best practices, and a related project would be improved access to WIFI on transit and on the ferry, where no service currently is available. We would also work with our transportation providers to undertake a feasibility study to convert our existing public transportation infrastructure to be completely electric. Beyond technology deployment, we would also request support for public opinion research need to collect good baseline data on key performance indicators, as well as an associated marketing, communications, and outreach campaign to encourage participation on the Platform—including its availability to visitors, to encourage them to explore the island without a private vehicle. We envision a fun, engaging, accessible, and intuitive front end that would reflect and celebrate the municipality’s recent whimsical branding, and that support social interaction and the “quirks” that are part of the rich character of small communities. Again, we intend to share our experience with the other small Canadian communities that are similarly struggling to provide their residents with integrated, cost-effective, safe, shared, and low-carbon mobility solutions. This might be accomplished via a series of webinars for local-government audiences conducted in conjunction with a partner such as the Federation of Canadian Municipalities, or a presentation at the annual Union of BC Municipalities. Question 7: Please describe the ways in which your preliminary proposal supports your community's medium and long-term goals, strategies, and plans. The proposed Community Mobility Platform aligns well with the objectives and goals outlined in numerous documents, including the forthcoming Integrated Transportation Master Plan, the Official Community Plan, and the 2018 Strategic Plan. In the latter document, council stated its support for a Smart Cities Challenge application pg. 16. Objective 11: “To meet or exceed Provincial targets for reductions in GHG emissions by creating a more energy efficient community.” pg. 17. The application is also supported by Objective 19: “To work with other agencies, stakeholders and the community to achieve energy conservation and emissions reduction goals” pg. 20 an well as the Section 4 - Towards a Sustainable Future: Transportation and Mobility. Pg. 66. As noted elsewhere in this application, Bowen Island Municipality is finalizing its Integrated Transportation Master Plan, which is built on a community vision of “simple, seamless, sustainable transportation options for every Bowen Islander.” The proposed project would work in tandem with—and accelerate the implementation of—this 20-year plan. Priority projects over the next 20 years will be a cross-island multi-use path, pedestrian improvements in Snug Cove village, and coordinated inter-regional travel with both private and public transit providers. The plan also includes many elements to build pedestrian and cycling networks, optimize and expand transit service, encourage alternative options, streamline access to regional destinations, and advocate for better accessibility. The proposed Community Mobility Platform would integrate a Smart Cities approach to the plan, which would in turn catalyze transformative and deep, systemic, and sustainable change. Question 8: Please describe your community's readiness and ability to implement your proposal successfully. Given its small size, Bowen Island Municipality has a respectable track record for achieving results. This is largely due to the innovative and creative approach of elected officials, staff, local organizations, and independent businesses. Further, our community has a rich tradition of volunteerism, which is evident by the number of highly qualified professionals who serve on municipal committees. An example of this type of successful partnership is the community’s distinctive, innovative, and effective branding project, which launched in 2017. The Municipality’s volunteer Economic Development Committee led the project in partnership with Tourism Bowen Island and municipal staff. A national creative agency ultimately developed the brand on an entirely pro bono basis. The value of the donated work exceeded $150,000. The community brand is more than visuals and logos— it’s the very essence of the community and its people and is captured in the brand story. The creative team based its work on more than 600 interviews with visitors, residents, and business owners. Once adopted by Council, the municipality phased in the brand for signage, websites, stationery and other communications tools. Staff developed and implemented brand guidelines and licensing policy and agreements. The brand is available for businesses for a nominal fee and not-for-profits at no charge. Upon its release, the brand attracted significant media coverage. Bowen Island Municipality’s largest water system, known as the Cove Bay Water System, is supplied from Grafton Lake. The current treatment for the surface water is sodium hypochlorite disinfection. This treatment is not sufficient to meet the Canadian Drinking Water Quality Guidelines. The municipality is committed to provide additional treatment to comply with the guidelines. The overall goal of the Cove Bay Water Treatment Plant project is to help provide clean, clear and safe drinking water to the more than 600 households that use the Cove Bay Water System. The Municipality received a $3,890,367 grant from the joint Federal/Provincial Building Canada Fund – Small Communities Component, which represents a two-thirds share of the cost of the full-scale water treatment plant. The estimated cost to build the treatment plant is $5.7 million. Staff identified ceramic membrane filtration as the preferred approach to meet the municipality’s needs and goals. As this is a relatively new technology for the municipal market, the municipality conducted a three-month pilot study to determine the efficacy and efficiency of the technology. The ceramic ultra-filtration membrane process – a technology developed in Canada – removes bacteria, pathogens, and organic matter in the water. This reduces the quantity of chlorine that must be added to the water in order to meet Vancouver Coastal Health Authority’s Drinking Water Treatment Objective. This is a complex project overseen by the Municipality’s Public Works and Finance departments in conjunction with an international engineering firm. The volunteer Cove Bay Water Local Advisory Committee, made up of volunteer residents, provides supplemental support. Design development is currently well underway on the recently-identified parcel of land. At present, Bowen Island is one of a handful of communities its size in the province without a dedicated community centre. Upon completion, the Bowen Island Community Centre will be be a place for people of all ages and interests to gather—fostering and inspiring connection, understanding, caring, creativity and the economy. The proposed building is a 15,000 square foot civic facility providing community, recreational and performing arts spaces and municipal offices. The building will be constructed on a portion of land owned by the municipality, adjacent to the Bowen Island Community School. The Community Centre will provide accessible spaces for a variety of functions including performing arts. It will support recreational programs under one roof, allow for expansion of community-based services, and provide infrastructure to the community for long-term recreational and cultural opportunities. Bowen Island Municipality is partnering with the Bowen Island Arts Council to build this facility. The estimated cost of the building is approximately $10 million. As a component of a capital fundraising campaign, provincial and federal infrastructure and arts funding grants will be part of the financial plan to pay for the project. Council has dedicated funding and staff resources to move the project forward, building upon past endeavours. The project is led by the Community Centre Steering Committee that includes Council members, Chief Administrative Officer, Chief Financial Officer, Manager of Recreation Community Services, Executive Director of the Bowen Island Arts Council and the Recreation Commission representatives. The Committee and staff have worked closely with its project manager and architects. The project is well into the design development and financial strategy stage. The Municipality is preparing for a referendum borrowing bylaw for the October 2018 municipal election. - Hiring a part time Emergency Plan Coordinator, who has implemented BowenENS, an opt-in public notification system designed to quickly notify residents in case of an emergency. - Augmenting and supporting additional services provided by Emergency Support Services. - Organizing the Neighbourhood Emergency Response Program. Working with the Rotary Club to install and maintain over 15 publicly available Automated External Defibrillators (AEDs). - The Municipality’s Emergency Planning Coordinator works closely with the Emergency Program Executive Committee which is made up of local stakeholders – the RCMP, BC Ambulance, community school principal, municipal departments and other local organizations. All the above-noted endeavors illustrate some of the complex projects the Municipality has undertaken. As a small island community, every successful project embraces a multi-dimensional approach involving different levels of partners and stakeholders. The Project Team will include a project coordinator with experience in transportation planning along with key senior management staff, the Chief Administrative Officer, Chief Financial Officer, a Council representative and key community stakeholders. Question 9: Describe your plan for using the $250,000 grant, should you be selected as a finalist. Provide a high-level breakdown of spending categories and an accompanying rationale. If our proposal is successful, our objective by the end of the 12 month period would be to have successfully built the technological framework for the Community Mobility Platform through community consultation, staff capacity building and innovative partnering with our project partners. In addition to having a working prototype ready to launch, it is envisioned that we would have taken operational steps to have begin transitioning our community shuttle to an on demand and route-deviated service, completed feasibility work and proof of concept for smart parking and an all electric transportation network, designed a “smart” pedestrian network and improved our WIFI connectivity/real time tracking ability throughout our transportation network. A key aspect for the success of this project and a game changer for a small community like ours would be the ability to dedicate staff resources to lead and coordinate a project such as this and to be able to contribute to community best practice as well as new and innovative ideas. The project coordinator would work closely and support the project steering committee, plan and co-ordinate public engagement, oversee and coordinate work of project partners, and oversee project progression and reporting. This role would also be the organisation’s champion for innovation and smart communities solutions across all departments. An important step needed to launch the project would be the design and execution of a public engagement and stakeholder consultation strategy. As previously noted we would build on the success of community engagement done for the integrated transportation masterplan and this has also informed our budget costing for this line item. We would also look to strategically leverage further funding opportunities through the implementation of our transportation plan as well as funding opportunities at the regional and provincial level. Smart parking initiative, proof of concept study. Metro Vancouver is host to a growing cluster of information technology startup companies that are actively developing mobile, local, social, and/or real time Smart City solutions. These companies are working to address on-demand dispatch and tracking, on demand deviated route flexible planning, peer-to-peer ridesharing, public transit planning, autonomous vehicles, smart transportation networks, and more. Our Lead Technology Partner would develop, test, deliver, and maintain the software and network infrastructure that would serve as the proposed project’s technology backbone. If our application is selected for further consideration, we would release a Request for Expressions of Interest to determine market interest. Translink, our region’s publicly funded transportation authority, would be a vital partner in this project. We have approached the agency with this proposal, and as it is eager to see solutions that result in more efficient use of resources and that build overall ridership, it is excited and supportive. Translink is also interested in the potential to replicate a successful model in other service areas around Metro Vancouver. BC Ferries, a crown corporation, would also be an important partner in the project. The municipality enjoys a productive relationship with the company, and we believe our proposal is strongly aligned with the company’s long-term sustainability agenda. BC Ferries has shown positive interest in the initiative. As noted elsewhere in this application, an eclectic mix of private transportation and mobility services presently address different segments of the Bowen Island community. We would engage with these companies to explore opportunities for collaboration and ensure the proposed Community Mobility Platform complements and enhances their services. We have also received positive interest from Caring Circle, a community non-profit organization that provides information about access to health and social services. We would also investigate the opportunity to partner with a national and provincial associations connecting smaller communities, such as the Federation of Canadian Municipalities and UBCM. We would do so to gather information on transportation and mobility challenges of similar sized communities elsewhere in Canada, to inform platform development and maximize replication opportunities. We would also share back our experiences with other communities through this partner’s communications networks. Should this proposal advance through the Smart Cities Challenge process, our next step would be to organize a key stakeholder meeting with private transportation providers to validate feedback we have received through previous stakeholder engagement. We would also follow up with initial positive conversations with Translink and BC Ferries. In spring of 2018, we asked the Bowen Island community to submit ideas for the Smart Cities challenge application. The deadline to submit ideas for Bowen Island's Smart Cities Challenge application was March 30, 2018.